"The instrument we're about to use has an interesting sound. A bit like a duck waddling into an electric fence"
When Lisa Hannigan took to the stage at the Festival of World Cultures recently, it soon became apparent that the collection of florescent shapes and items there were more than decoration. We'd hear some funky sounds. It's concerts like hers that make me glad I'm not a music writer - though Deana over at State covers the concert excellently - as trying to define her music or style would involve a lot of me saying "Well, she's a bit like them but better and a bit like her but better and she's remind you of her but is much better than that". So there'll be none of that. Instead, from my vantage point, I got to watch a girl who's passionate about her music, moving and grooving in her own rhythm as she sings her songs. The lyrics of her new songs - with names like Sea Song, Lille and Venn Diagram are distinctively hers. A lovely play on words, an understanding of rhyme and metre and, similar to her collection of instruments, a respect for what sounds good on the ear gives a pretty unique sound, one that I could listen to forever. It is though the rhythm of each melody that deepens the lyrics. The percussion on each track is quite strong and her understanding that her voice is also an instrument, to be played in harmony with the others that enhance the simplicity, and thus impact of her words. "Have your coffee, splishy splashy frozen up the stairs" is a lovely line from Splishy Splashy while the song I don't know -if I walk your way I will keep my head we will feel our way through the dark - is destined to be a most requested on the various radio "love zones". Her new album Sea Saw, released this Friday has already gotten great reviews and looks set to be a best seller. There's something very likeable about her. It may be the smiles while she's singing, the effort she puts into sending her words soaring out over us on an August evening or the obvious camaraderie she has with the other musicians on stage. It may be the voice - as velvety chocolate in speaking as in singing or the way she acknowledges the friends and fans who have come to support her at this, her first concert at a Festival. She seems shy, almost apologetic for her intrusion, even though it's her we've crowded into the garden to see, to hear and to enjoy. There's a great crowd. On stage she's radiant and her casual style, long hair in a ponytail to one side, discrete (if any) make-up and a lack of jewellery all contribute to the image of this young Dublin woman who values her music and happiness above the superficiality of appearance. While she's singing or performing the music seems to take her over, seems like that's all there is. And maybe it is. Though best known for her collaborations with Damien Rice, Lisa has gigged with many Irish performers including Mic Christopher and Glen Hansard and recently at the Dublin Fringe Festival with Cathy Davey in the imaginatively titled Songs That Scare Children. She's about to start an Irish tour and then heading off to the USA where she'll gig with Jason Mraz in New York and Los Angeles. It's her distinctive voice that made the song Some Surprise, the duet with Snow Patrol frontman Gary Lightbody on the Cake Sale album in aid of Oxfam such an instantly recognisable and popular hit. When we sit down after the gig she's happy to talk. There's no sense of self-importance about her - she's keen to discuss her music, her experience and her passion. Up close she's stunning without realising it. It's her manner, her openness to what may be a stupid question or one asked a hundred times, her easy smile that makes the whole experience enjoyable - somehow special. Were you nervous? Do you find this kind of thing daunting? Well it's our first festival, the first time I've played a gig like that in front of so many people. I suppose yes, there's always the nerves but the crowd reaction, the welcome and the feeling on stage is part of that too. You seem to have a pretty unique set of instruments. Why so? We just looked for things we sounded good. Simple instruments that sounded a bit plinky plonky. It's fun to try things like bells, a xylophone, a squeezy box. It's all part of the music. We get on well together and enjoy it. Tomo is on drums, Donagh Molloy on guitar, Shane Fitzsimons on double bass with Gavin Glass on piano and guitar. What advice would you give for people starting out? At this Lisa smiled brightly and said "Just do as much as you can. Get as much experience as you can and keep playing. Find people to play with, play with friends and keep the music going. Really there's nothing better than going out and just doing it." Finally, having given a performance you seem to have enjoyed and smiled throughout, what advice would you give for people who want to be happy? Oh gosh, that's a tough one. Go out and do a festival in the sunshine. Surround yourself with friends and good positive people. Keep smiling. I know in the next picture it looks like I'll hit her, but that's not it at all - couldn't resist including it. I'd actually like to give her a hug for being so authentic, so warm and friendly. "Celebrity" or no, there's a unique aspect to Lisa that makes being in her company, for whatever time, quite cool. Sea Saw, her new album is out this Friday. Her mammy and herself stitched the unique design apparently. 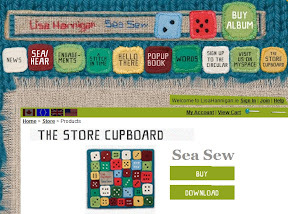 Head on over to her recently launched website on www.lisahannigan.ie for a feast of treats, including song lyrics and samples, tour dates and a coming-soon blog. She's appearing in Tower Records in Dublin on September 13 and playing in the Button Factory and Whelan's before heading around Ireland including Limerick, Donegal, Ennis and Cork. 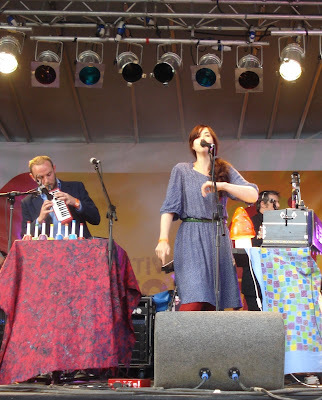 I'd keep an eye on the name and an ear for the sounds of Lisa Hannigan. She's going to be a superstar. You always make me want to be 'there'! 'a smile on a Monday ...' I love it. I had meant to go see her at the picnic, the bloody timetable had her clashing with something big though. great article and photos, as always! She's amazing and so friendly. I was at Oxegen years ago with my college buddies, it was one of the lads birthdays that weekend (his 21st). We spotted her early in the day pottering around barefoot but then saw her up close in one of the smaller tents she was just watching the gig with the rest of the crowd, my friend was mesmarised by her so when the band finished I went over to her and told her my friend was a huge fan that that it was his birthday and would she come over and say hello. She came over with me without hesitation and sang Happy Birthday to him. I think it was the best Birthday Present he ever got. I can't wait to get the album, I have it on pre-order from Road Records! Oh she's so lovely. I was there at her set at the festival too but was miles from the stage and surrounded by drunk people so looking forward to actually hearing her next week at the Button Factory. great article! was there too in dun laoghaire, she really played a fantastic gig,with her dance moves and all.. like becs,who's probably just beside me, there were some quite rowdy lads in front of me, but enjoyed it overall as i was dying to see her.hope the album goes well, it surely will!! Saw her last night at The Pearl Theater in Las Vegas with Jason Mraz. Took my girls to see Jason, and had never heard of her...but now I am an instant fan. I LOVED her and can't wait to get her CD. By the sound of her music and her style..she seems like a lovely soul. Not to sound ignorant, but what is that keyboard instrument she plays? I just saw her on the Colbert Report and I'm fascinated by her, her sound and the instruments. Please educate me. I think it's a harmonium, Deborah!